Singer-songwriter Chad Wilkins plays the closing music at Wednesday’s Ecstatic Dance Spring Equinox Celebration at Impact Hub, and again Thursday night with bandmates “Local Reasoning” at Reggae at the Royal. Originally from Lake Tahoe, NV, Chad has been living in Australia since 2004. 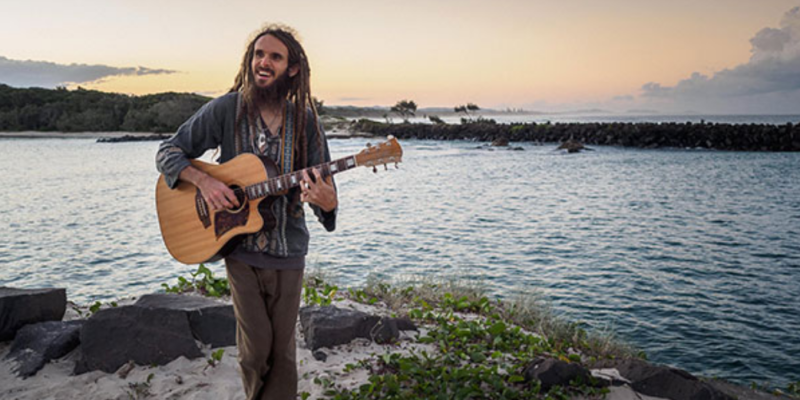 Chad plays a mix of genres, ranging from reggae to folk to “prayerful chants,” and he hopes to help move people toward environmental, social and spiritual consciousness through his interactive performances. Chad recently released “Incredible Mystery, Pt. 1,” the first part of a two-part album. Salt Lake City is Chad’s last stop on his West Coast tour. On Tuesday, I had the chance to catch up with Chad. Kaleigh: When did you start playing music, and what drew you to music in the first place? Chad: I’ve been playing music since I was little, but as far as in a professional capacity performing, since about 2013. I think just an expression of creativity, letting that flow through me as well as kind of a spiritual tool; expression of my spirituality and connection to the source. Kaleigh: Can you give me an idea of your creative process? What was your process in creating your latest album? Chad: The process of creating comes at all different times, you know sometimes your just driving down the highway and you gotta pull over to the side of the road to get your song out. Sometimes it comes really inconveniently like that. Sometimes you just get a little bit of a song that comes through and you gotta just sit down and work it out and get the rest of it. Chad: Uh-huh, exactly! You can’t do that though, you gotta catch it. You gotta catch it when it’s coming. Kaleigh: Ya, probably best to be prepared when inspiration strikes. So do you collaborate with any other musicians? Chad: Yeah, I’ve got a band that travels with me. Atranov is on drums Thomas is on bass and Trevor is on flute and percussion. Kaleigh: You have said that you want to create change, so what social or environmental issues are at the forefront of your mind right now? Chad: I guess for me my role is not targeting certain issues, but kind of a broader approach of bringing just a higher level of consciousness and spiritual awareness to people. That kind of affects people in that they are more conscious of their decisions in all areas, you know? I kind of see that as my main role. But I guess for me some of the things that kind of come up a lot in my mind, even though it’s not what I talk about or sing about, is you know things like climate change and war and just general human angst and being judgemental and unaccepting of other parts of humanity. Kaleigh: Yeah, I got you. So you believe creating change on a spiritual level will change the political sphere and climate and things like that. Chad: Exactly, exactly, yeah. I value all of it, I just see myself, kind of my gift and my role is to just kind of bring about love, you know? Use music in that way. Kaleigh: Good answer. Okay, so I’ve read that for Hindus, dreadlocks are a worn by holy men, and for Rastafarians it’s a symbol of political unity and Pan-Africanism. Do your dreadlocks have any particular meaning to you? Chad: Um, yeah, for me no, it’s not much of a deep spiritual thing other than I feel like in my dreadlocks there’s like a record of my life since I’ve had them, you know? It feels like I carry around a record of my life with me, and it reminds me of all the life lessons I’ve learned in my travels, and, you know, the challenges and beautiful times I’ve been through in life. Kaleigh: That is interesting. I’ve never heard it put that way before. So what does the word spirituality mean to you since we’ve talked about that topic a lot this interview? Chad: To me spirituality means, everyone is a spiritual person, everybody has a spirit, and I guess, to me spirituality is about being awake and aware and conscious of that truth and prioritizing and considering and being aware of your connection to the source and all things, and then bringing that into your everyday life; how that affects the decisions that you make and the way that you live day-to-day. Kaleigh: Do you have anything else you want to add or say to your fans? Chad: We are playing after the “Ecstatic Dance” Wednesday night, and then on Thursday we’re playing at the Royal, “Reggae at the Royal.” As far as a message to everybody, just stay conscious, stay loving, keep going. You know, let the hard times help you grow, and let the good times fill you to let you enjoy life more and love more.